By establishing March 4 as "National Marching Arts Day," we will spotlight and celebrate the positive effects on young people and our society from lessons learned and life skills acquired through involvement with the unique collection of activities comprising the "marching arts." Marching Arts activities includes marching bands, drum corps, drill teams, color guards, drum lines, step teams, string bands, pipe bands, fife and drum groups, military bands, ceremonial groups, parade groups and other ensembles promoting music making, entertainment, cultural enrichment, self-confidence, teamwork, leadership training, goal-setting, responsibility, competition, good sportsmanship and fun. In order for this petition to be considered by the Obama Administration, we need to collect 100,000 signatures by April 2, 2013. 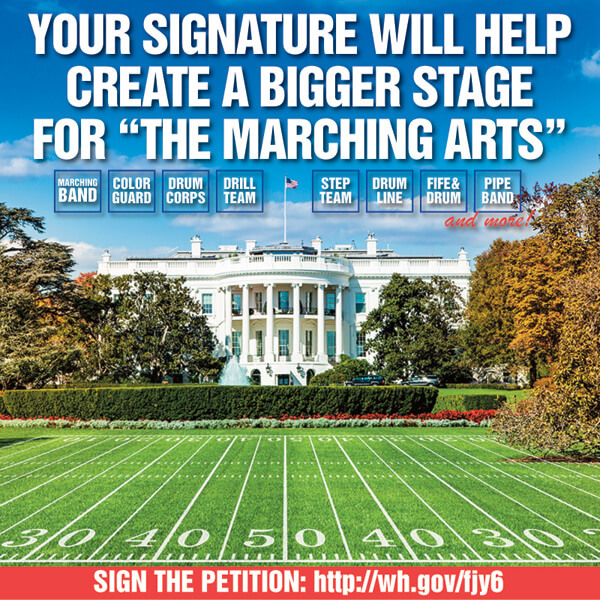 Help create this outstanding opportunity for our country to recognize the remarkable achievements of people engaging in the Marching Arts. March forth today and help establish March 4 as National Marching Arts Day!